We often think of innovative and properly designed products as doing what they’re designed to do, well. But, what is really great is when something does what it’s supposed to and so much more – when it leaves its meaning open to interpretation even though its purpose is well-known. It’s original purpose is to hold hair in place. It contributes to the experience of beauty without calling attention to itself. Yet it’s simply a bent piece of metal. It is used by experts and amateurs, women and men, movie stars and regular folk. Its uses span the spectrum from holding hair, picking locks, stealing cars, and short circuiting aircraft landing gear, to personal grooming, holding papers, being used as jewelry, as a screwdriver and more. Yet, you don’t enter a store seeing flashing lights and arrows pointing to the aisle where the bobby pins are. You have to look, and often look hard. You may even have the experience as I did of asking someone if they had a bobby pin and her responding that she hadn’t seen one in years! 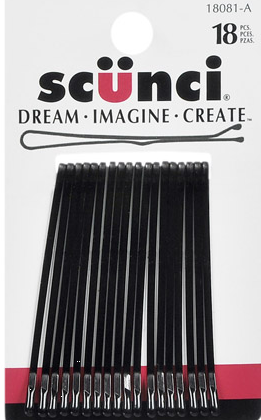 But they are around and during the course of a typical day a bobby pin has the potential to come to the rescue more often than an iPad. Which gets me back to my original point. I’m typing this on my laptop, an elegant piece of machinery, a wonderful tool that I can load with programs, and even configure some of those programs myself. Yet, its inner workings are known only to the engineers and designers who developed it. I can do very little to make this laptop be more than a computer. But, for pure creative potential, for engaging the sense of touch, for prototyping and playing, for simple elegance and even cost effectiveness, the bobby pin is much more than a bobby pin. What really makes these infections even more tragic is that most of them are preventable through changes in behaviour. To increase awareness and educate healthcare providers, Kimberly-Clark has started the “Not on My Watch” campaign. Instead of waiting for institutions to train their employees, Kimberly-Clark is cruising around the country with the “HAI (Healthcare Associated Infection) Education Bus,” a mobile classroom bringing CE accredited courses right to the doorstep of hospitals. Additional info videos are available on this website along with additional references. Overall, this is a pretty slick idea to bring CE accredited courses to clinicians as opposed to them having to schedule time away from their work. Kimberly-Clark should be applauded for their efforts in keeping HAI’s in the forefront of people’s minds. There are two issues here though that could be improved upon. First, there doesn’t seem to be any succinct, articulated goal. Yes, the purpose here is to keep healthcare workers updated on the most current trends in infection management and to bring down the incidence of HAI’s. But, nowhere is there an explicit goal as there was in the 5 Million Lives Campaign. The use of the phrase, “Not on my watch,” while powerfully motivating to individuals to prevent HAI’s while they’re on the floor, has a built-in blame as in: “That happened on your watch,” when something happens. Yes, blame can be a powerful motivator as well, but no one wants towork under fear. Second, research has shown that educational campaigns are only as good as the systems into which they’re planted. In other words, people learn and people forget. Even when people know what the right thing to do is, pressures from hospital admins, superiors, patients and families, often result in the right thing not being done. I’ve personally witnessed well-educated nurses doing the wrong thing more times than I, or anyone, would like to see. A perusal of the Tools page , while full of treatment guidelines and recommendations, reveals little that most healthcare workers haven’t already been exposed to. That said, it is helpful to have these all in one place. So, is this a good thing that K-C is doing? Of course! It’s admirable and good to educate. But, what would be really cool, and would probably have more impact, is to have a bus full of designers that goes from hospital to hospital teaching them how to apply tools like positive deviance in improving healthcare outcomes. Hmmmm, I wonder where I can get a bus…. Wednesday, at the final day of the Design Research Conference, a panel discussion was held on the topic of design research and its role. One panelist, Don Norman, was particularly animated about the need for design research to better serve industry by providing the results of the research in an expedited manner. ‘It’ is: Expediting design research to help industry develop products faster. This technique may or may not work with non-product design but thinking about it, I’m not sure there’s a reason why it shouldn’t. So what is this process? 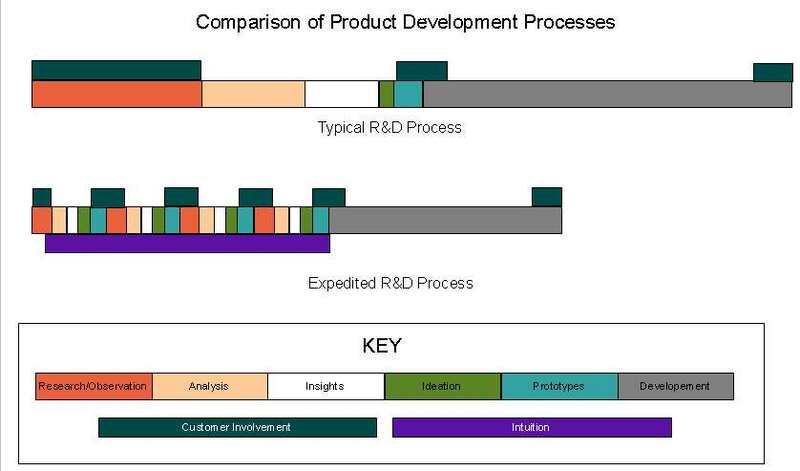 Here’s a diagram of the comparison between how design research is done in traditional programs and in expedited programs. Will Technological Innovation Eliminate the Perceived Necessity for Social Change? Conferences are great in that they make you think. Today was no different. While attending the Design Research Conference in Chicago today I heard references to technology being the great equalizer. Those specific words weren’t used, but during one case study looking at the redesign of a hearing aid, an elderly gentleman noted how when he uses current hearing aid technologies, their designs don’t disguise the fact he’s losing his hearing and in fact draw attention to it. The result is that he feels marginalized by society. The solution, obviously, was a better designed hearing aid that utilized really cool technology that didn’t draw attention to itself but yet made the hearer’s life easier. First, let me say that there’s nothing wrong with utilizing technology to make the lives of the elderly easier. But the above case study, and another mention of the ‘saving value’ of technology yesterday, got me thinking. So, I did a Google search of “technology” and “save us” and the two phrases together bring up 934,000 hits. Apparently, I’m not the only one seeing a pattern. Again, I’m not against technology at all, but if we rely on technology to come to the rescue of our designs, then aren’t we missing the point? …(A)ll of technological optimism can be summed up in one desire: The desire not to have to change any of our current behaviors. And, yet it is our behavior that most of all needs changing. That’s the crux of the issue – behaviors. Here we are, innovating for a better world but at the same time, by extensively using technology we tacitly agree that the world and the people around us aren’t going to change their behaviors. So, we use technology to make it less painful for those marginalized by society so they can live in a world of people who are cold. Something doesn’t seem right here. If we get efficient at palliating social stigmas through technology, will we reach a cultural tipping point where the desire to improve one’s self is no longer felt as a need because everyone around us seems ok? Is that an acceptable situation? Is this a real possibility? What could we do to prevent it from happening if it is? Why does IDEO’s approach to design thinking and Tim Brown’s definition below have to include technology as a given? Does the definition for human centered innovation have to include the necessity of technology? I was recently reading the new, Making Ideas Happen: Overcoming the Obstacles Between Vision and Reality , by Soctt Belksy, the founder and CEO of Behance. “Please take yourself and your creative pursuits seriously. Your ideas must be treated with respect because their importance truly does extend beyond your own interests. Every living person benefits from a world that is enriched with ideas made whole – ideas that are made to happen through your passion, commitment, self-awareness, and informed pursuit. In the day to day grind it’s too easy for us to lose track of the fact that what we’re providing to our families, employers, clients and the world, are not faceless concepts. We enflesh ideas – our gifts come with a face! We need to fight for our ideas, to stand by them, to even let them go if need be. We need to realize that humans are privileged with the supranatural capacity to bring beauty into the world. What is this supranatural capacity? A flower drops its seeds to guarantee more beauty next year. It is the natural way for a flower to bring beauty into the world. Humans bring beauty into existence through the work of our minds, hearts, hands and relationships. Sure, by nature we have this capacity, but it’s also a choice we make. It’s a both/and type of situation. We are able to create outside of, or above, the natural order, all the while still being a part of it. It’s supra (above) – natural. A fish brings its beauty of ‘fishness’ to the world even while dropping its waste products into the water it swims in. But it has no choice and it can’t improve the situation on its own. If it over-populates and over-pollutes its waters, its population naturally dies back to bring the system back into balance. If a bunch of fishes had the supranatural capacity of humans they would realize that their actions impact the environment and respond accordingly. But they don’t. They’re fishes that are part of, and act naturally within, their system. Humans willingly ignoring their supranatural capacity (and interestingly enough not acting ‘naturally’ any more) will be at the mercy of the system (and vice-versa! ), and like the above mentioned fishes, throw the system out of whack until the people die back. So you see, acknowledging the supranatural aspect of human nature isn’t an option. It’s a necessity. It’s a prerequisite to bringing beauty to the world through our ideas; to building sustainable cultures of innovation that respect people and the world. My mom’s desire for me, is also my desire for you. Please take your responsibility seriously. In a recent conversation, a colleague pointed out that when he’s with his wife (who is a photographer), he tries to see what she sees when she stops to take a picture. It got me to thinking about how difficult that could be. After all, the photographer is trying to capture a specific image from a specific perspective to hopefully evoke a response of some type. In short, the photographer is trying to convey an essence of what is depicted. But, to an outside observer, until that image is captured, it’s very difficult to get into the exact perspective of the artist. This is very similar to what is experienced in the realm of problem solving and designing solutions. Before any solutions can be found, the problem needs to be framed – it needs to be depicted in its essence so that the situation is experienced and known in a way in which general directions of action are self-evident. A proper frame will also often have an emotional component that helps motivate those working on the issue. So what needs to be present in the framing process? From an artistic point of view there are, basically, four aspects of framing. They are present even in pictures we take with cell phones though the camera controls and ‘optimizes’ these variables for us. Artists, on the other hand, are acutely aware of the impact of each of these variables and they skillfully control them so as to maximize the impact of the framed image. 1. The Frame-Does it take in a wide or narrow view? Square, Round or another shape? 2. Location of the Viewer-What angle is one looking through the frame? Close to the frame or far away? 3.Moment at Which Frame Capture Occurs -What is happening at the point in time when the framing is occurring? What is the lighting like? What are others not in the center of the frame doing? 4. Length of Capture Time-What transpires during the framing time? Is is a static or moving situation? Long or short exposure? These same four variables can be used to guide us when framing a problem that needs to be solved. The difference though, (if it really is a difference) is that a properly framed problem contains the solution! 1. Type of Frame – Is your frame specific enough to point out what seems to be the main problem, while not being so specific that it effectively eliminates certain environmental/system issues that may play a part in finding a more elegant solution? 2. Location of the Viewer-Can the stage be set so that everyone from stakeholders to clients to team members look at the same thing from the same location at the same angle? Is it obvious to everyone that the best starting point occurs at this locus of perspective? 3. Moment at Which Frame Capture Occurs– Is the framed problem capturing the right moment? Are we looking too much at what happens before or after what we think is the issue? 4. Length of Capture Time- This is related to number three but it’s more about emotion. Do we capture the problem with a short exposure in which details are crystal clear, or a long exposure that blurs the details but provides us with sensations of motion and activity? Keep in mind that just as photographers will often take hundreds of pictures to end up with one that really ‘works’, so too, problem framing is a process of creating multiples, and even redefining and refining the frame as more is learned. If we stay cognizant of these four framing variables during the process, not only will we get at the essence of problems, but we’ll be well on the way to capturing the solutions.